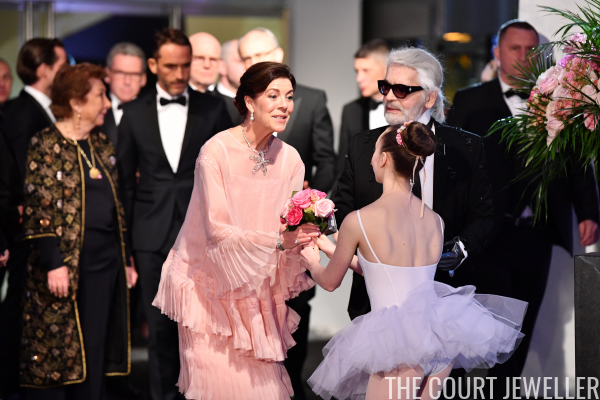 On Saturday, the Grimaldis of Monaco hosted one of their biggest charity functions of the year: the annual Rose Ball, which benefits the Princess Grace Foundation. 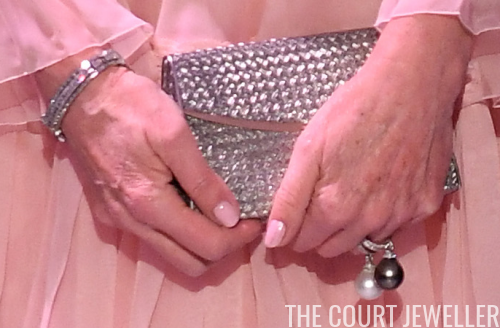 Here's a look at the sparkling jewels we saw at the event, which had a "Manhattan" theme for 2018. The most senior member of the princely family in attendance was Princess Caroline, who has acted as hostess of this event numerous times, following in her mother's footsteps. 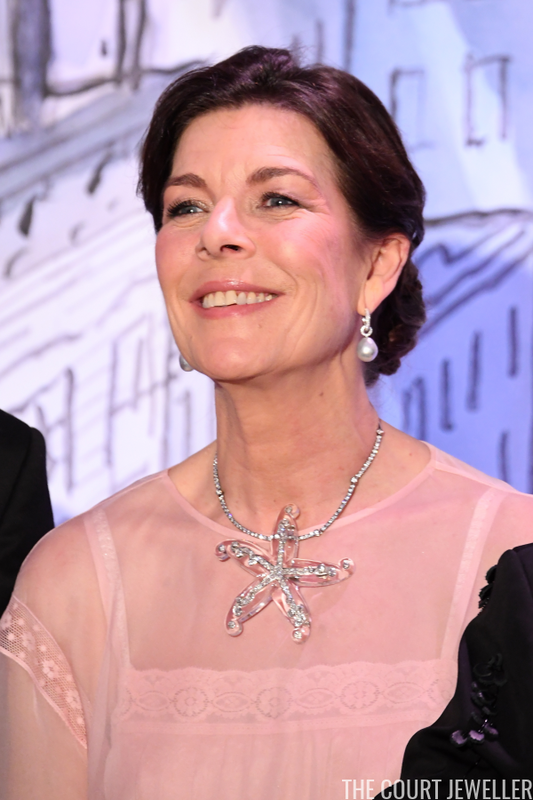 She wore an intriguing set of jewels for the ball: diamond and pearl earrings, plus an eye-catching necklace, which appears to made of crystals and lucite in an oversized starfish design. A diamond bracelet also sparkled on her right wrist, and diamond rings on her right hand were balanced by a pair of fascinating diamond and pearl drop rings on her left. 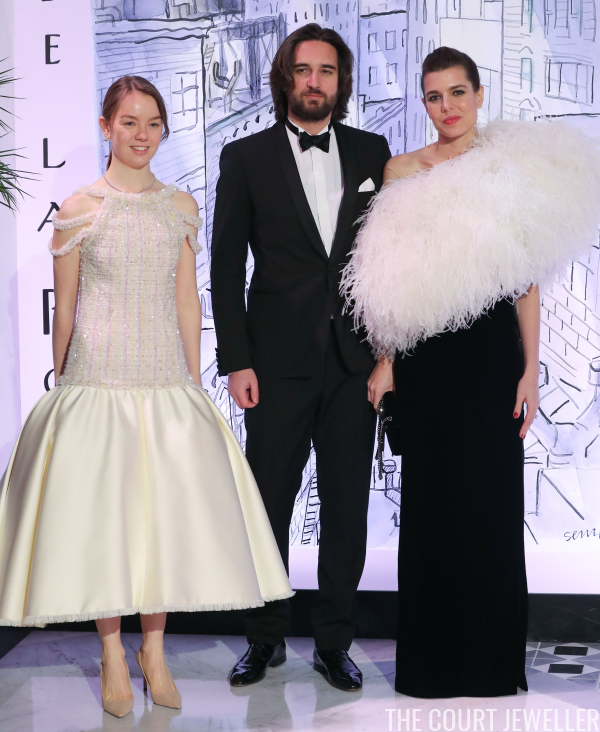 Caroline's elder daughter, Charlotte Casiraghi, made a dramatic appearance in a black-and-white gown by Yves Saint Laurent at this year's ball. She accessorized with a single earring, featuring two drop pearls, suspended from her right earlobe. ...and Charlotte appeared to perhaps confirm the engagement by wearing a diamond ring on her left hand. The ring was set in yellow gold, echoing the setting of Meghan Markle's engagement ring. Pierre and Beatrice Casiraghi, who are expecting their second child, were also in attendance this year. 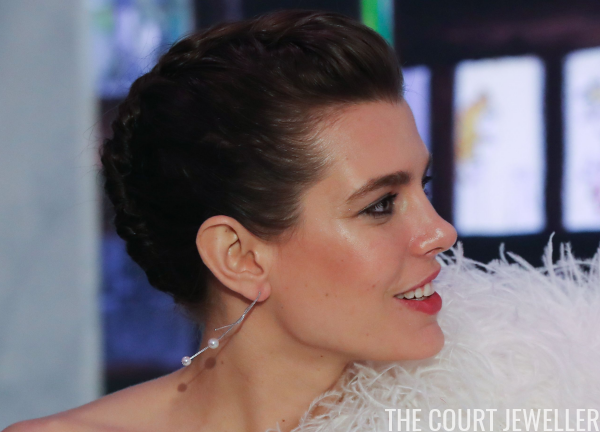 Beatrice has been one of the most exciting jewelry-wearers in Monaco in recent years, and she didn't disappoint at this Rose Ball. A pair of elaborate diamond and ruby statement earrings were balanced by a simple diamond riviere. And on her left wrist, Beatrice fastened a large diamond bracelet. You'll note the similarity to Queen Mary's Chain Link Bracelets, which are now owned by Queen Elizabeth II of the United Kingdom. 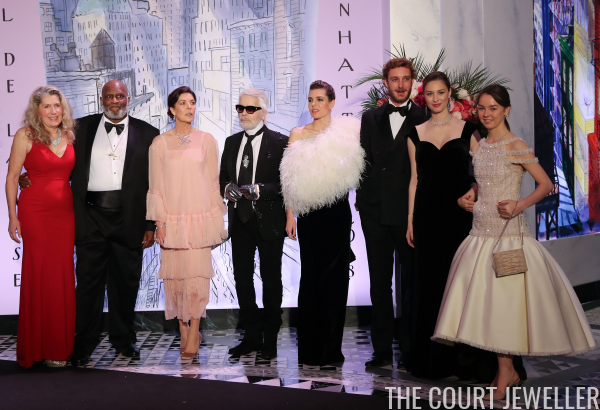 Here's a look at Beatrice's entire ensemble for the event, which was reportedly designed by Alberta Ferretti. 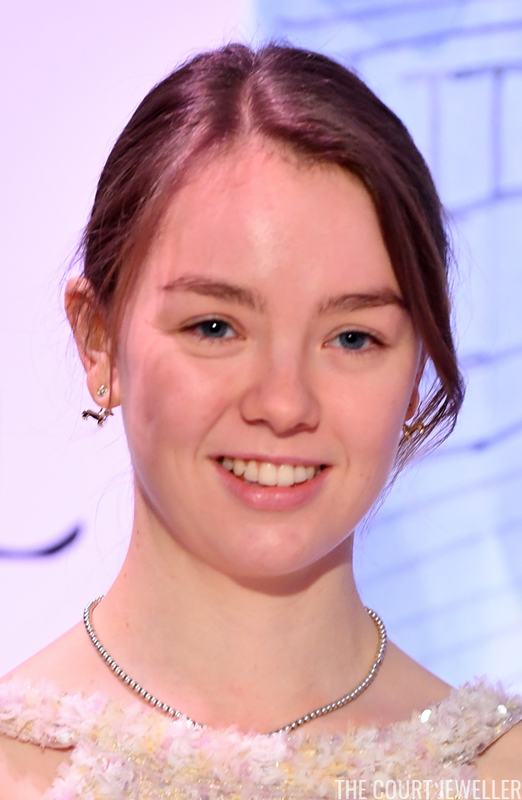 Caroline's younger daughter, Alexandra of Hanover, jetted back from Peru in plenty of time to attend the Rose Ball. She wore a silver beaded necklace with a pair of witty jacket-style earrings. Note that the pendant portion of the earring is shaped like a dachshund. A German hound design for a Hanoverian princess, perhaps? 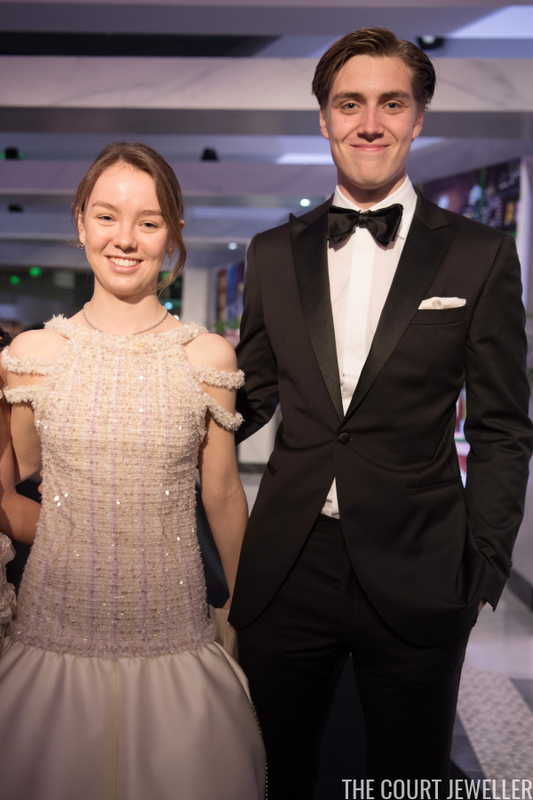 Alexandra's boyfriend, German basketball player Ben-Sylvester Strautmann, also attended the ball. And here's a look at Alexandra's entire outfit for the evening, which was designed by Chanel.